RA (via email): theres a guy on youtube ... manipulating parameters in fractal software. 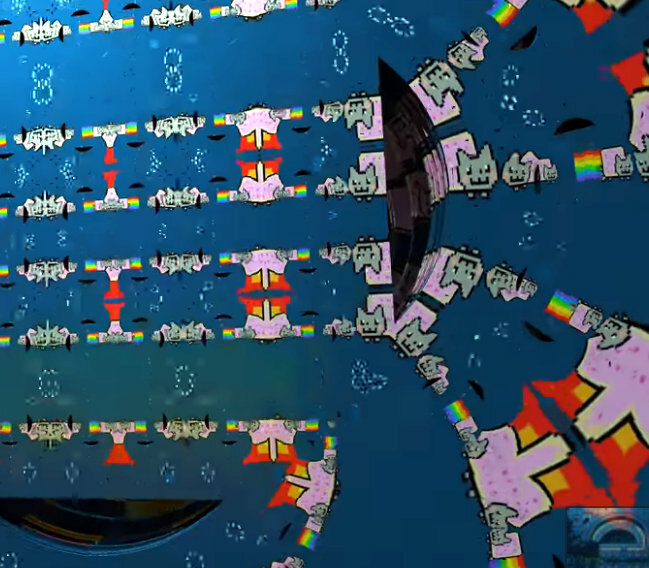 i went to his channel last night and he posted a 'test' of some sort of new texture feature in his software and used the nyan cat in the background as the texture. the end result feels particularly interesting, its a very weird mash up i think. i should also add ... if you look at his other videos, they are all kind of serious, or he has demos being really helpful teaching how his workflow is. this 'cute' vid kind of caught me by surprise, more so than if the channel was filled with nothing but like funny or silly stuff. TM (reply): Agreed the mash-up of (trivial) cat and (ominous) 3D borg cube is interesting. The cat improves with all the flipping and spatial permutations. And yes let's hope he doesn't do another 20 like that (with various meme videos). The nyan cat in the background is blurry (probably enlarged in Firefox!) and then returns to something closer to its original resolution as it shrinks and grows. I suppose fuzzy pixels are needed for the sake of the 3D illusion.